Call for Participants (CfP) has always been primarily focused on academia and the majority of researchers using our platform are from universities. Despite that, we have recognised that our product can help more people to conduct research. Since our first year, we are often contacted by scientists from companies' R&D departments, charities, market research companies, independent research teams, and NGOs. And so, we decided to selectively open up our website for commercial users and continue further on our quest to aid the advancement of knowledge through scientific research. Recently, we reached out to one of our commercial clients, People for Research (PfR), who CfP have helped recruit over a thousand participants. But who are People for Research? "Bristol-based People for Research are the UK’s leading participant recruitment experts in the user research and UX/usability industry. We recruit thousands of participants every year to take part in paid research and testing sessions across the UK, as well as in other countries such as the USA, Netherlands and Germany." What challenges does Call for Participants provide a solution for? "We started working with Call for Participants in mid-2016, using the website as an extra source of fresh participants interested in taking part in paid studies. Working in participant recruitment means finding the right people to take part in research and testing whilst following specific briefs, so CfP has been really useful when trying to reach a new group of people who are already engaged with research and testing, but probably don’t know People for Research." What role does Call for Participants play in your recruitment activities? "The CfP platform has been a great complement to our database growth and recruitment strategies. Although our research showed that we were more likely to get new participants from a younger demographic via CfP, we quickly realised the platform was able to provide participants from all age brackets and social groups, which is really positive." Have you used platforms similar to Call for Participants and how does it compare? "The only similar platform we have used in the past was Gumtree. The main difference is that by being able to post unlimited studies on CfP for a fixed monthly fee, instead of paying per post on Gumtree, we generate a lot more sign ups and book more participants for a better price per sign up/booking. Our CfP page acts like a separate homepage for PfR, reaching a new audience that is already familiar with the idea of research/testing." 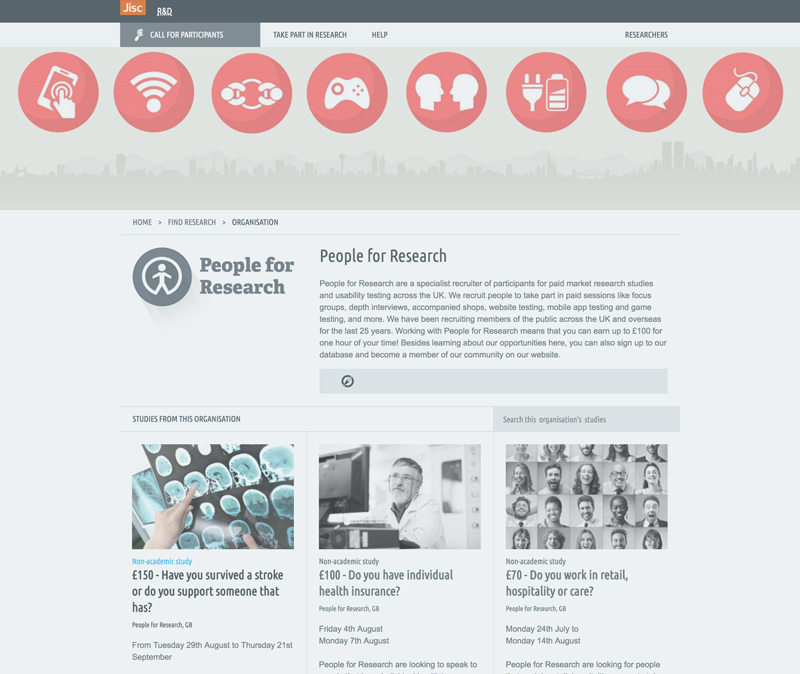 People for Research's organisation page. It is their home page on CfP and shows all of their current and past research Study Pages. What benefits has Call for Participants delivered to your company? "The greatest benefit is a good relationship price/quality per new sign up and booked participant. It also helps to increase the number of backlinks to our website, which provides a small but steady boost to our SEO." What kind of recruitment results did you get from Call for Participants? "By sharing our paid studies on the CfP platform, we have been able to recruit a good diversity of participants for user research and usability testing sessions. The biggest surprise we had in the past was probably when we realised we could even attract small business owners through the website, which was something we weren’t expecting." Has Call for Participants been worth your investment? "Yes! We have been able to sign up hundreds of new participants via CfP since we started sharing our paid studies on the platform. Not only the numbers are good, but we have found that the people who get to know PfR via CfP are quite reliable and active on our own website once they sign up."